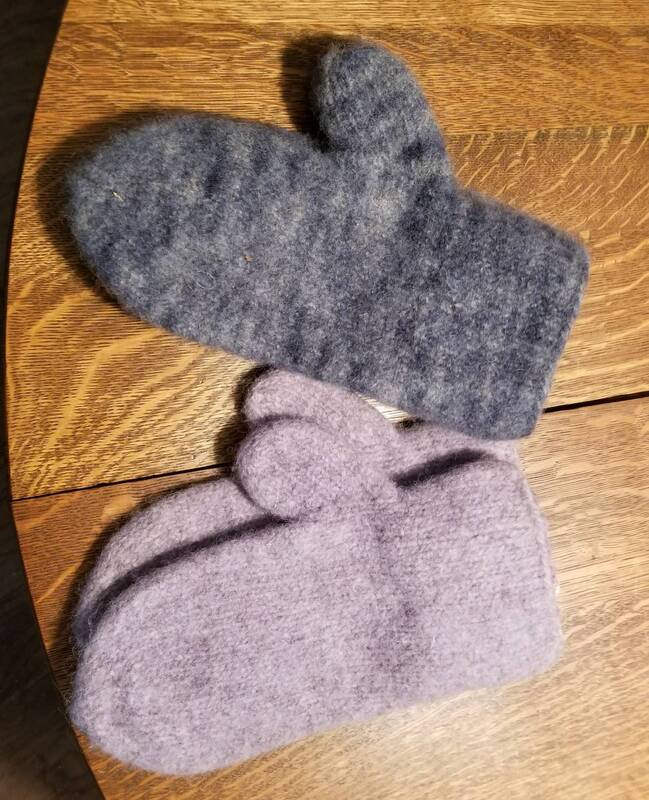 I have two pairs of hand knitted hand felted mittens. Both pairs are made out of hand dyed churro wool. These mittens are large enough to wear a pair of regular driving gloves inside. The have a separate knitted cuff attached to the inside of the mitten. They are nice to wear when you have to clear snow off your car. They keep your hands dry and warm. Pair 1: large storm blue variegated. 11.5 inches long by 5.5 inches wide. Pair 2: light lavender. 11 inches long by 5 inches wide. Please specify what color you want. Yes, I do Custom and Personalized orders. I require at least 30 - 45 days to complete an order. I can do any woven or knitted items, in any colors you choose. Depending on the yarn used and time frame for item will determine the cost of each custom item. I will require 50% up front for item once we agree on the price and any other details, then I will send you detailed pictures of the item and once I receive the last 50% I will ship immediately. I highly recommend you dry clean any of the items I make. These are of natural materials and will shrink. Most of what I use is 100% wool (unless otherwise specified). If you wash wool, and dry it, it will felt up and you will not have the same item you purchased. Each item is a different size, I will post measurements for each item where applicable.